In the reverse engineering business, no two projects are the same. There are always different challenges, and we have to apply our capabilities to overcome them. Recently, we had a customer come to us with a particularly unique project. It was an unusual, custom part that was broken, and there were no replacements. So we were tasked with making the replacement. 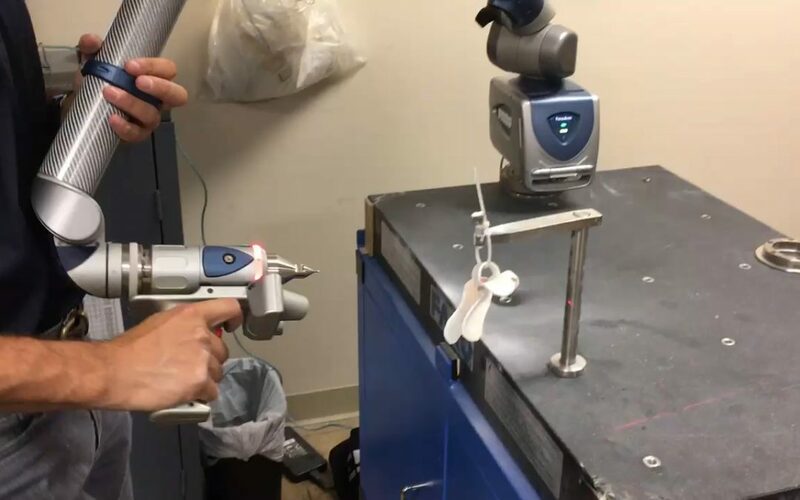 The project demonstrated how reverse engineering isn’t just one process, but finding the right combination of several processes to get the desired result. The customer is not a company, but actually an individual. He is an amatuer artist who creates ink drawings as a hobby and a creative outlet. He also happens to be paraplegic. So he needs an ergonomic pen holder — designed specifically for his hand — in order to grip the pen and make his drawings. The original pen holder was made with several pieces of heat softened plastic, molded to each other and his hand. Over time, his pen holder had became too small for his hand, and eventually it broke. Suddenly, he had no way to create his art. That’s when we were asked if we could help. Fixing the existing pen holder was not an option since, it had become too small for his hand. In order to create the new holder, we had to first create a 3D model in SolidWorks. To do that, we glued the broken holder back together and scanned it using our Faro Edge ScanArm laser scanner. The result is an STL file, also known as a triangle mesh, that can be imported into SolidWorks. From there we modified the design of the holder, extending in several design-prototype iterations until it was just large enough to fit the artist’s hand with a snug fit. Once we had the design where we wanted it, we could 3D print the holder itself. This allowed us to create a working prototype the artist could try out to see if it fit and worked for his needs. Sometimes, this might be the end of the process. If you’re just creating one product, 3D printing is often the best solution. But in this case, there was a problem. The holder kept breaking. Because the design put stress on the holder in two dimensions, and 3D Printing (using the FDM method) tends to be weak in the dimension of the layer lines, there wasn’t enough lateral strength in the plastic material we used to stand up to normal use. 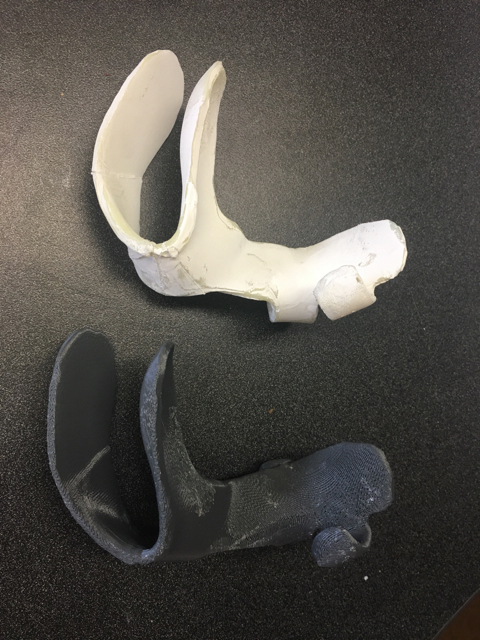 If a 3D printed product doesn’t meet the needs of the project, either due to a need for greater quantities at a lower per-unit cost, or in this case the performance limitations of the process, urethane casting is often a great alternative –and it’s relatively inexpensive. In the case of the pen holder, we 3D printed a mold and cast the product in a urethane that cures at room temperature. We also incorporated “ribs” into the casting to give the holder greater strength to hold up under normal use conditions. By combining three of our capabilities — laser scanning/3D model creating, 3D printing, and urethane casting — we were able to meet the needs of this unique project. But every project is unique, and so are the solutions. By having an understanding of the reverse engineering process, and the right tools in place, we are able to design solutions that meet the precise needs of the project.